Now from Arizona, U.S. new epidemiological data adding to mounting, consistent evidence: disconfirming prediction of benefit from increasing substitute buprenorphine and methadone medical “fix” for the opioid crisis – indicators of high-risk opioid use (non-fatal opioid overdose) rise significantly in response to medical “treatment” while OD deaths decrease in response to a naloxone campaign. Okay, that doesn’t look so good. But appearances aside, the medical fix must be working, we can be assured it is. We know it is because America’s top medical and public health authorities have looked at the research and know that opioid substitution treatment (OST) is preventing opioid-related deaths and is, in fact the fix for the lethal epidemic created by . . . well . . . by America’s top medical and public health authorities, based on their critical evaluation of the research on the effectiveness and safety of use of opioids for chronic pain, based on their research literacy and clinical judgment. Okay . . . but that was then, decades ago, and surely, as blatant and egregious as was that craven abdication – of media oversight and investigative role, of institutional, medical, research and public health responsibility for competent use of research-informed policy to protect public safety – surely there has been correction: learning, accountability, and refocus on competent vetting and critical analysis of research conclusions used to drive public health policy. After all, there is a clear consensus: among medical and public health authorities, in research journals and from America’s top research institutions, in major media, among popularizing writers. Buprenorphine and methadone substitution as fixes for the lethal opioid crisis not only work, OST is a gold standard. Or not. Or all that established science rationalizing investment of public funds in OST Goes Without Saying because it Comes Without Saying: without the benefit of meaningful, competent critical thought and discourse, just as in the craven abdication, not so long ago, of institutional, medical and media responsibility to public health, to avoid harm, that enabled the lethal opioid crisis. Or nothing has changed. For example, nothing to prevent America’s leading medical journal from endorsing vaping as harm reduction under a plan that would encourage use of e-cigarettes, that promotion and failure to warn and protect public health within months helping drive a child substance use epidemic. And nothing to prevent this lethal research/media disinformation and threat to public health – overtly false misrepresentation of medical approach tobacco smoking cessation product success rates based on grossly negligent and/or incompetent evaluation enabling violation of the most elementary and basic of research design and interpretation standards – for cigarette use, whose annual morbidity and mortality public health costs eclipse those of opioids. But . . . but . . . the research for OST, the medical cure for the lethal opioid crisis, is solid, supporting the gold standard of treatment for opioid use disorder, evaluated and validated by America’s top medical and research authorities and institutions. 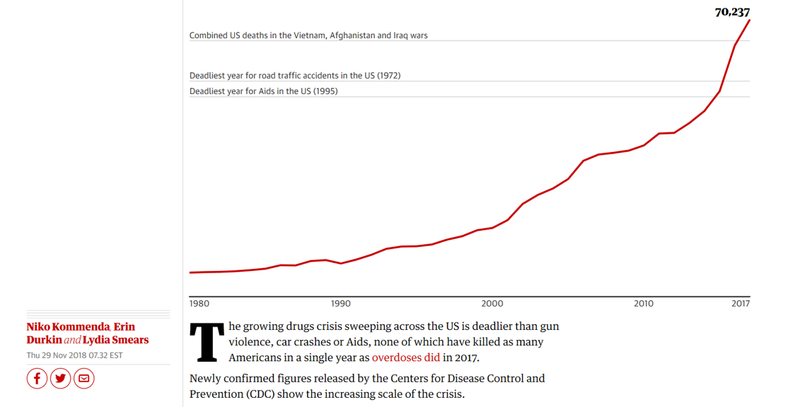 Okay, okay, so America’s trusted, authoritative medical, public health and research institutions did, through grossly negligent and incompetent or malfeasant generation or use of public health disinformation enable the increasingly lethal opioid crisis. Did endorse an unsupported vaping harm reduction scheme that has generated a child addiction epidemic. Did commit the most overtly negligent errors in elementary standards for interpretation of research to falsely promote significant benefit to ineffective “treatments” – e-cigarette use and nicotine replacement therapy (NRT) – for the lethal condition of cigarette smoking. But those same institutions and respected authorities are probably actually right on target, competent and credible in their evaluation of the research supporting use of addictive, diverted and abused opioids as a medical cure for the lethal crisis created under their oversight. With so many lives at stake, and a competent watchdog press protecting the public, they would have to be? 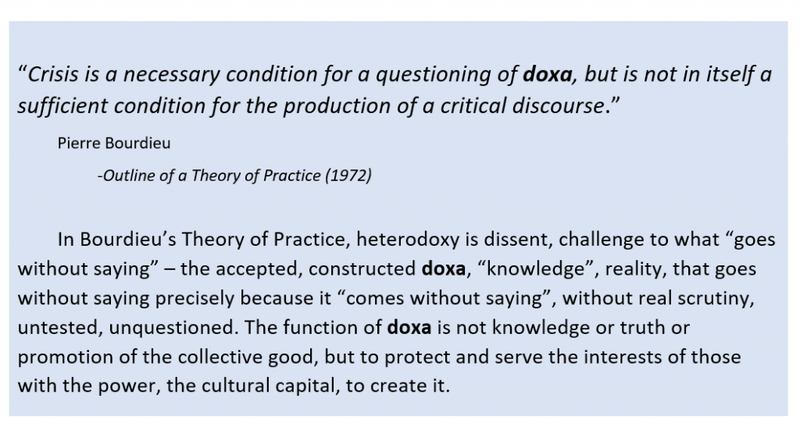 And research-illiterate popularizing writers, without training or competence in design, interpretation, or critical analysis of research, helpfully branding OST as a “gold standard” and the “fix” for a lethal public health epidemic can be taken as authoritative, can’t they? Still, there are problems, signs. Like the steadily mounting mortality and other public health costs associated with significantly increasing provision of the medical cure; and the widespread diversion and abuse of that cure fueling economies of opioid abuse in communities and prisons. Probably wouldn’t hurt to take a look at that evidence. With all those American lives at stake, all those already lost. Fortunately there are ways to evaluate the claims, and there are emerging bodies of evidence for that evaluation. The Science: Following French Failure, Americans Get a Substitute Addictive Opioid as “Fix” for the Opioid Crisis, Marketed as Reducing Overdose Deaths Does It? 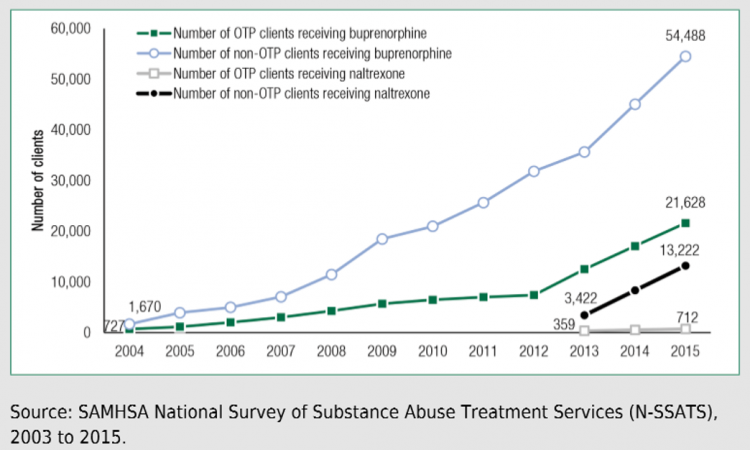 A new, large study of opioid-dependent patients in the UK, followed for 12 months after opioid substitute treatment with buprenorphine and methadone, with no findings of significant benefit in reduction of OD deaths, “drug related poisonings” = DRP. A new, anomalous case of significantly reduced incidence of OD deaths against the continuously worsening national trend – in Dayton, Ohio – where evidence can directly link the reduction to a naloxone campaign, not to OST/MAT. 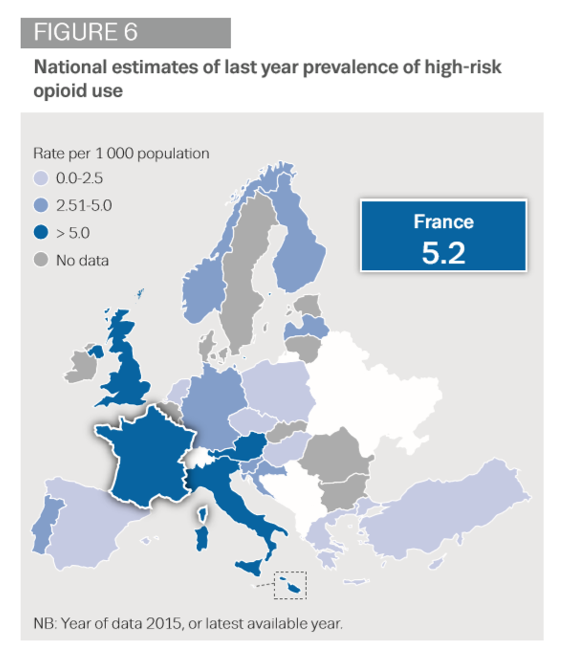 Additional outcome measures from France inconsistent with benefit from decades of unrestricted medical provision of substitute opioids as “treatment” – France remaining 5th worst of 20 European nations in “high risk opioid use”. Discussed in recent posts, one of multiple lines of evidence consistently invalidating benefit from OST – drug injection-related infectious endocarditis as a measure of high risk opioid use – has increased in Canada and in Ohio associated with increasing population provision of doses of the OST medical fix. That’s the opposite of predicted if OST by provision of methadone and bupe were providing benefit by reducing high-risk opioid use. 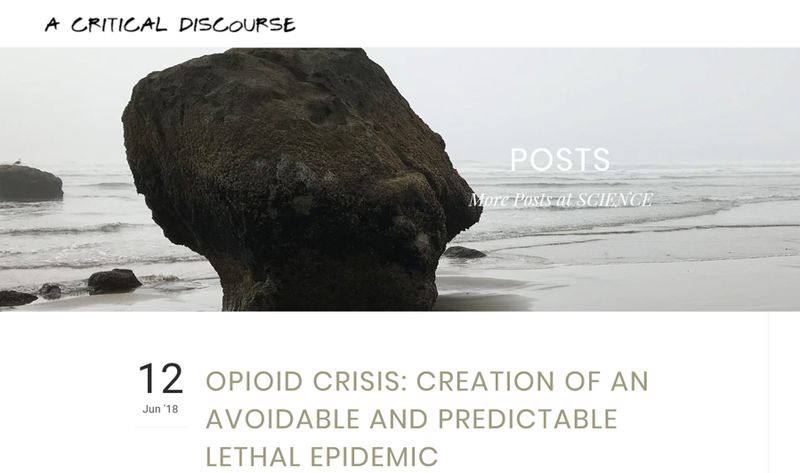 To repeat – as explained in detail in this post and here, evidence for benefit from the medical/pharmaceutical industry medical fix for the medical/pharmaceutical industry-generated lethal opioid crisis requires an explanatory mechanism. Unlike the beneficial lethality-preventing effects of naloxone – observed and counted directly in emergency or medical settings when a user at risk of overdose death is revived by use of naloxone (Narcan), any presumed role of OST in reducing OD deaths or providing other benefit must be achieved, measured, and statistically significant (in credibly designed and interpreted research with durable results and external validity) as reduction in high-risk opioid use – that’s how any hypothesized benefit would occur. We are in a multi-wave opioid epidemic: the prescription wave and associated deaths, the heroin wave and associated deaths, and now the fentanyl or synthetic wave of opioids,” said James Hodge, a law professor at Arizona State University. Those involved in outreach to drug users in Arizona say they are finding fentanyl in all kinds of drugs — from meth to cocaine to heroin. Now the pace of overdoses in Arizona appears to be accelerating. 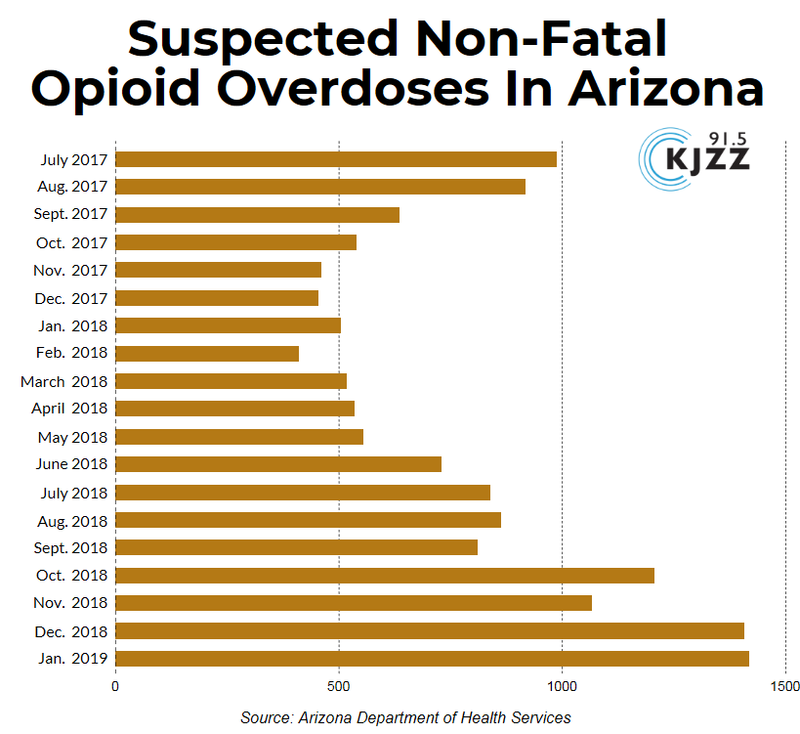 Overdoses reached an all-time high in January — with about 600 more overdoses reported in that month than in September, according to preliminary state data provided to KJZZ News. Dr. Cara Christ, director of the Arizona Department of Health Services, says they are still looking into what is driving the recent spike in non-fatal overdoses. “The department is looking at this data. While our overdoses have gone up, the reported deaths have remained relatively steady, so that is a positive trend,” she said. Christ cites the effort in Arizona to widely distribute the overdose reversal drug Naloxone as one possible reason that the death toll has not climbed significantly. Dr. Christ is on to something. There is no body of studies that control for, that is allow differentiation of and assignment of causative effects to, presumed beneficial effects due to OST versus concurrent increases in availability and use of the OD-reversing drug naloxone. That would be almost impossible to control for in any type of study, or in any case be unethical. Community and national programs to increase availability and use of naloxone have developed concurrently with development and/or expansion of OST programs – leaving longitudinal studies confounded by at least two uncontrolled effects. Clearly it would be unethical to block access to the life-saving OD-reversing drug in any type of designed study. In studies that are not randomized, subjects volunteering for OST versus those who decline, would be more motivated not only to use the medication, but also to access additional supports and services, some of them evidence-based – psychotherapy; housing support; employment support; social services; other. Subjects accessing regular medical-setting visits as part of receiving a substitute opioid would necessarily more likely be offered and provided (confounding) protective supports and services especially OD-reversing naloxone kits and instructions on how to use them – for themselves and significant others. Naloxone, from consistent evidence, accounting directly for all apparent reductions in OD deaths in epidemiological trends. While our overdoses have gone up, the reported deaths have remained relatively steady, so that is a positive trend,” she said. As detailed in a series of posts – documented instances of use of naloxone, nationally and locally, can account for any apparent decreases in OD deaths directly, leaving no reductions for OST to account for. To attribute positive effect (reduced opioid-related OD deaths, morbidity) to OST requires evidence of reduction in high-risk opioid use linked to patient engagement in OST – that is the mechanism by which OST could provide benefit and is required to attribute any such benefit. Let’s think critically for a moment. Reduced opioid-related OD deaths could be due to revival by naloxone, engagement in OST, other psychosocial protective factors. But the evidence consistently points to naloxone as accounting for any apparent decreases. As directly observable and recorded. – required to attribute benefit to OST? Consistently the evidence disconfirms reductions in high-risk opioid use due to OST, instead points to worsening of high-risk use associated with increasing provision of the medical fix for example here, here, here, and here. Now in Arizona too, where high-risk use, as measured by non-lethal overdose prevalence, has increased significantly. Arizona was granted $24 million dollars for opioid treatment and prevention from the SAMHSA State Targeted Response (STR) Grant the funds implemented for OST programming in October of 2017. Immediately, those and state funds were used to quickly expand access to bupe and methadone, at clinics open all hours, seven days a week, 24/7, and with new clinics with the same expanded hours. But according to this state report other services prior to the expansion of dispersal of substitute opioids – a campaign focused on expanding availability and use of the OD death-reversing drug naloxone – began earlier, by June of 2017. It included widespread training of law enforcement personnel, provision of naloxone kits, and increased availability of naloxone to responders as well as private citizens. ADHS identified a need to train local law enforcement agencies on proper protocols for carrying, handling, and administering naloxone in overdose situations, in order to positively impact the opioid epidemic through rapid treatment of encountered suspected overdoses. Approximately 1,000 law enforcement officers have been educated through training events held throughout the state. Professionals from 153 agencies have been trained on opioid overdose recognition and treatment, and naloxone administration through May 31, 2018. ADHS is coordinating continuing requests for law enforcement training with the Arizona Peace Officer Standards and Training Board (AZ-POST). Progress on naloxone distribution includes: • ADHS has free naloxone kits available for law enforcement agencies and first responders who are unable to bill for naloxone. Agencies can request naloxone by completing the request form on the ADHS website. • ADHS has provided 6,316 naloxone kits for 63 law enforcement agencies since June 2017. • 86% of people experiencing non-fatal overdoses since June 15, 2017 when enhanced surveillance was initiated received naloxone pre-hospital. 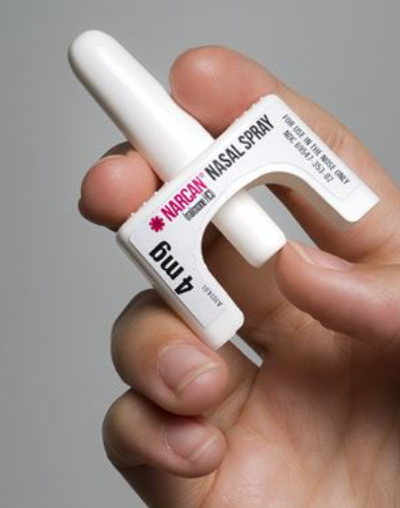 • Law enforcement officers have administered naloxone 549 times to 405 people since June. In all but 9 cases, the individual survived the immediate out-of-hospital event. In order to support increased use of naloxone to save lives in Arizona, ADHS Director Dr. Cara Christ signed standing orders that allow pharmacists to dispense naloxone to any individual in the state and allow ancillary law enforcement, correctional officers, and EMS to use naloxone for suspected opioid overdoses. A naloxone pamphlet was developed in both English and Spanish to assist in public education of opioid safety and naloxone use. 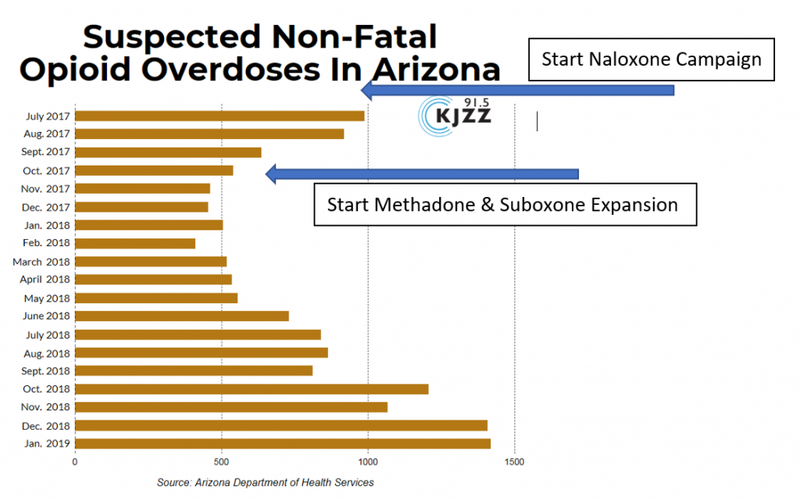 But how the treatment program has worked in Arizona, actually, is to have predictably – based on longstanding evidence bearing on OST – increased instead of decreased high-risk opioid use as clearly illustrated by a measure of high risk use: non-lethal opioid-related overdoses – non-lethal overdoses to factor out confounding effects of changes in use of naloxone to prevent OD deaths. Let’s look at the timeline and epidemiology. 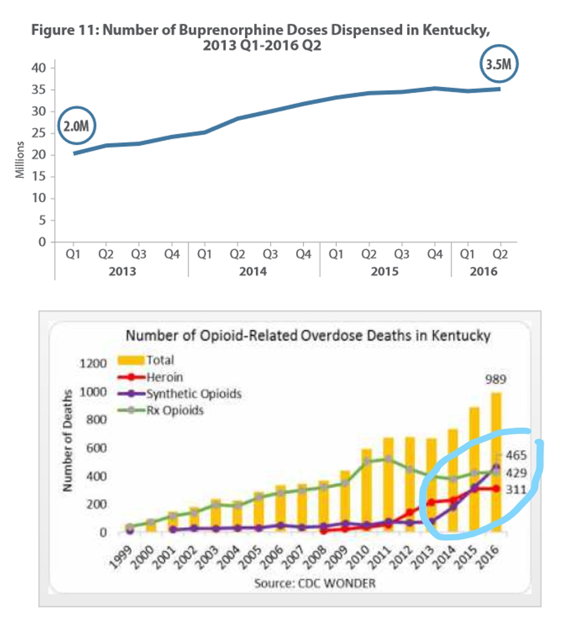 For both non-lethal and lethal opioid-related overdose prevalence, the numbers decrease after the naloxone campaign is implemented, and prior to OST expansion, through October 2017 – that’s when rapid increase in provision of substitute opioids buprenorphine and methadone was initiated. Then things change. For non-fatal overdoses – a measure of high-risk opioid use – prevalence then shows a steady increase through January of this year, over a period of 13 months. For lethal opioid overdoses, the picture not much less clear – an increase in deaths over the three months following initial expansion of OST, then highly variable mortality over the following 12 months, with no evident overall decrease in opioid-related overdose deaths over the period following OST expansion. Here’s why those results were predictable. As established by all lines of relevant evidence, effectiveness is disconfirmed. 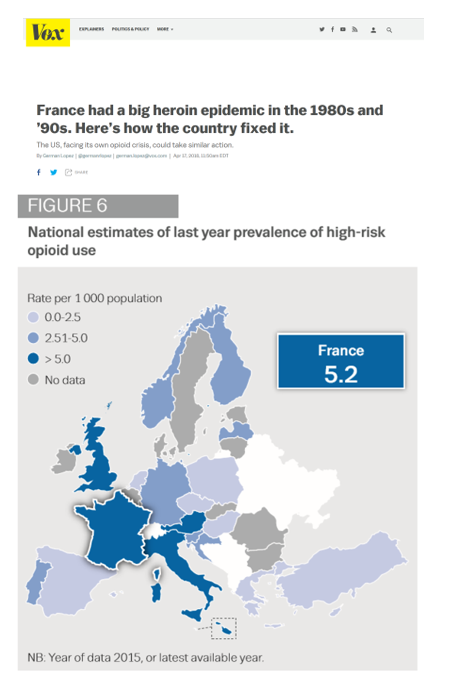 Its increasing provision is correlated with mounting opioid-related deaths, and in France over past decades of the world’s least restrictive medical provision of OST with diversion, abuse, and high-risk opioid use. of generation of the opioid crisis, methadone clinics serve as hubs for economies of illicit opioid and other drug use and dispensing of methadone is correlated with high risk of OD deaths. . That was part of the rationale and impetus for movement to “safer” alternatives. That history and recent accounts fit with observations and concerns of neighbors of CMC facilities in Arizona where “The parking lot, which is under constant surveillance by an off duty police officer and at least one traffic navigator, is frequently crowded with cars and people. For anyone passing by, the constant activity is hard to miss.” That description is similar to those of the “pill mills” fueling the opioid crisis with runaway prescription of opioid pain medications. is a currency and commodity driving community and prison economies of opioid abuse and high-risk opioid use. are often required to provide or offer some form of “counseling” and psychosocial supports, and Community Medical Centers was. From available evidence CMC provided the same Treatment as Usual (TAU) comprising standard addiction counseling in the U.S.
That is, programming without evidence of benefit, the four core elements – disease model of addiction; 12-Step and Alcoholics Anonymous orientation; group therapy; and “treatment” providers (addiction professionals) without competence to provide behavioral health therapies for any conditions, let alone the complex, life-threatening condition of compulsive substance use – instead predicting harm as established by longstanding evidence. Not quite. It’s worse than that. The “counseling” is reportedly provided primarily by “peer counselors”, the “key” to the program. Peer counselors are not counselors or behavioral health professionals at all, not qualified to provide any type of behavioral health services, but they sure are cheap. In the addiction treatment world, they are generally enmeshed in the religious subcultures of AA or NA, and typically orient clients in treatment to the relapse-predicting features of that and other elements of TAU that have helped drive worsening substance use epidemics in the U.S. for decades. That is, CMC is part of the harm-predicting criminal scam constructed as “treatment” that is the gold standard of care for substance use problems in the U.S. 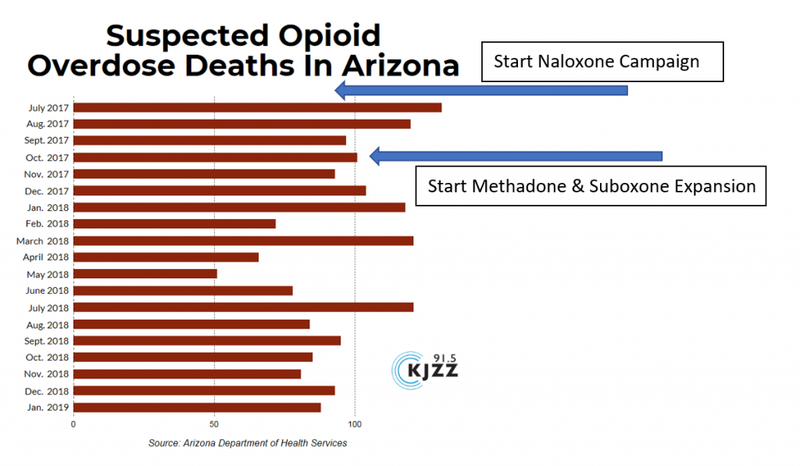 The escalating high-risk opioid use in Arizona is another example in a pattern – of failure and harm, of a lethal national epidemic of illness and death worsening as population dose of the medical cure, the medical “treatment” increases. It should be a sign, a lesson. It should by now be an indictment. There has never been research evidence to attribute reduced opioid-related overdose deaths confidently to substitute opioid (buprenorphine) campaigns instead of other plausible causes. Instead, direct evidence points to population effects of the OD death reversing drug naloxone – increasing in availability and use concurrently with bupe MAT programs – as accounting for decreases in OD deaths. In contrast to the direct, observable outcomes from naloxone use, attributing lethal OD protection to buprenorphine prescription requires evidence of a psychosocial (treatment, or “recovery”) mechanism – bupe in MAT programs reducing high-risk opioid use. There is no evidence for that mechanism, and consistent and mounting research and epidemiological evidence instead invalidates such protective effects presumed to link bupe campaigns to decreased OD deaths or other gains. Instead, consistent and mounting evidence establishes worsening, predictable harms attributable to the MAT bupe medical approach to the non-medial problem of compulsive opioid use including: continued opioid dependence; diversion; abuse; child exposure; involvement in overdose and overdose deaths; involvement in emergency medical visits; involvement in criminal drug trafficking. As currently designed and implemented buprenorphine MAT campaigns and practices are established by mounting bodies of evidence to predict harms, not benefits, and as such appear to constitute malfeasance, public health threat, misuse of public healthcare resources, and billing fraud.